Per Acre, Ton, Bushel, Etc. Enterprise budgets are used to calculate production costs. Enterprise budgets record the income or revenue, expense, and returns for a single crop or livestock production process. An enterprise is any coherent portion of the general structure of the farm business that can be separated out and analyzed as a distinct entity. For example, there is not a meaningful way to separate the oats enterprise into oats grain and oats straw enterprises, but the oats enterprise is separable from the corn or dairy enterprises. Enterprise budgets can be created for different levels of production or technology so there can be more than one budget for a given enterprise. (An enterprise budget results from looking at a point on a production function.) The base unit for enterprise budgets is typically one acre for crops and one head for livestock. Using these common units permits an easy and fair comparison across different enterprises. Enterprise budgets are generally for one year; however other time periods are permitted. Enterprise budgets can be used for both planning and financial analysis. The primary purpose of a planning enterprise budget is to estimate costs and returns per acre or per head. The primary purpose of a financial analysis enterprise budget is to determine actual costs and returns per acre or per head. Once this task is completed, enterprise budgets have other uses. They can be used to identify the most profitable enterprises to include in a whole farm budget and provide the basis for partial budgeting. Also, they will contain the data needed to compute the cost of production, the break-even price and/or production, and the sensitivity analysis on certain (fluctuating) prices or production factors. Incomes or revenues must be kept separately or separated when the enterprise budget is created. Expenses must be kept separately or separated. Transfers from one enterprise to another within the total farm must be recorded. Certain resources are used by more than one enterprise. This means a decision must be made regarding the allocation (by enterprise) of the costs associated with those resources. An enterprise budget should contain the name of the enterprise being budgeted, the State or region of the budget, and the year from which prices were selected. If the time length represented by this budget is different than one year, that period should be stated here. Typically, the incomes or revenues from the enterprise are shown next. The name of the revenue source, the quantity, the unit, and price per unit should be included (See Figure 1) to provide the user with the budget’s background. The cost section follows and is generally divided into two or three parts. Those parts are called by several different names: Operating (see Figure 2) and Overhead (see Figure 3); Variable and Fixed; or Direct and Indirect, but they all are basically the same. In the cost section, it is advisable to enter “obvious” cost items with a zero value if indeed the cost is zero. This tells the reader that the budget’s author was aware of the possibility of that cost and has assigned it a zero value in this budget. The “Interest on Operating Costs” item is normally calculated assuming the operating costs occur throughout the year and that the average operating costs incurred are 1/2 of the total operating costs. If costs are divided into three parts, the third part is labor. Labor is under the operating costs in this two-part system. Labor is sometimes treated separately because an author wishes to convey to the reader the importance of this cost and/or to show a return to labor and management in addition to a return over operating costs. This is especially true if all the labor required for the enterprise budget is the owner’s or the owner’s family because a “family draw” is required regardless of the enterprise’s income. The third section of an enterprise budget is the summary section (see Figure 4). 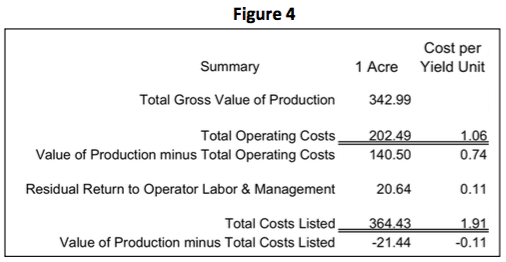 This section usually contains “Value of Production Minus Total Operating Costs”, sometimes called “Gross Margin”, the residual claimant (see note below) “Return to Labor and Management”, and the profit or loss (Value of Production minus Total Costs Listed) of the enterprise. This section can have one or more columns, depending on the information the author wishes to convey. Note: A residual claimant is a resource(s) that claims the dollars remaining, after subtracting all other costs from income, as its return. The fourth section of an enterprise budget is a listing of the critical values used in constructing the budget and some “what-if” analysis of certain (fluctuating) production factors and/or prices. Figure 5 is a break-even analysis table. It shows (in the body of the table) the yield (in bushels per acre) required for income and costs to be equal — for the corn enterprise to have zero profit – to break-even; as the price and total costs vary. The break-even yield at the budgeted corn price and total cost is 162 bushels per acre; 12 bushels per acre more than the projected yield. If the price was $1.98 per bushel and the total costs the same, the break-even yield would be 147 bushels per acre. Another example: if the price was 20 percent higher than expected ($2.16) and the total cost 20 percent lower than expected ($291.54 per acre), the break- even yield would be 101 bushels per acre. Another “what- if” analysis is called a sensitivity analysis. Usually this analysis shows how vulnerable the profit (Value of Production Minus Total Costs Listed) is to changes in the price and the yield of the major product. 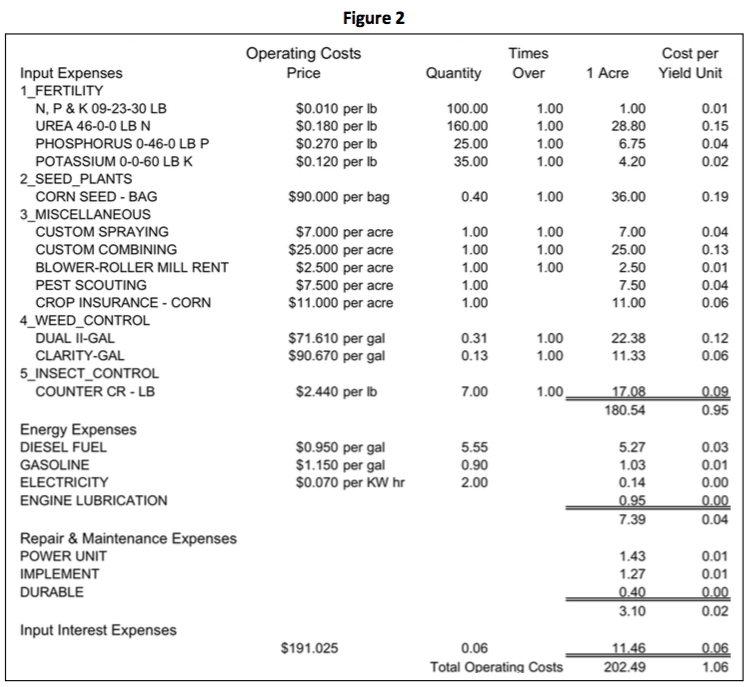 Figure 6 shows a sensitivity analysis for the example corn budget we have been using throughout. The profit at the budgeted price ($1.80 per bushel) and yield (150 bushels per acre) is at center of the table and is -$21.44. This is the same value as shown on the bottom line in Figure 4. If the price was $1.98 per bushel and the yield the same, the profit would be $5.56 per acre. 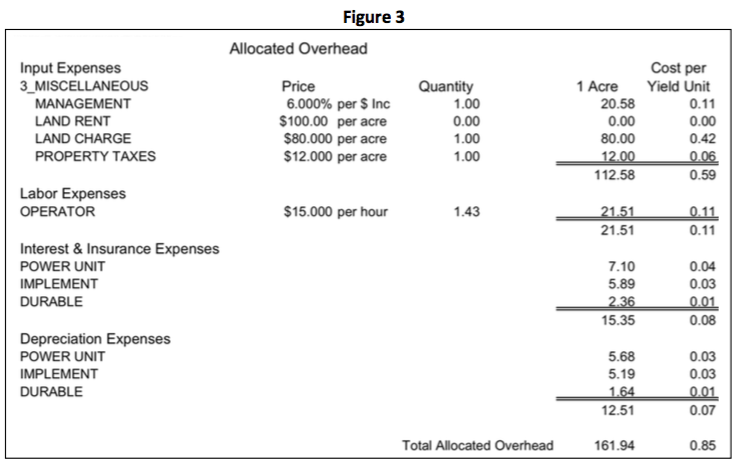 Another example: if the price were 20 percent higher than budgeted ($2.16 per bushel) and the yield were 10 percent higher (165 bushels per acre) the profit would be $64.96 per acre. Enterprise budgets can also provide you with a wealth of other information. 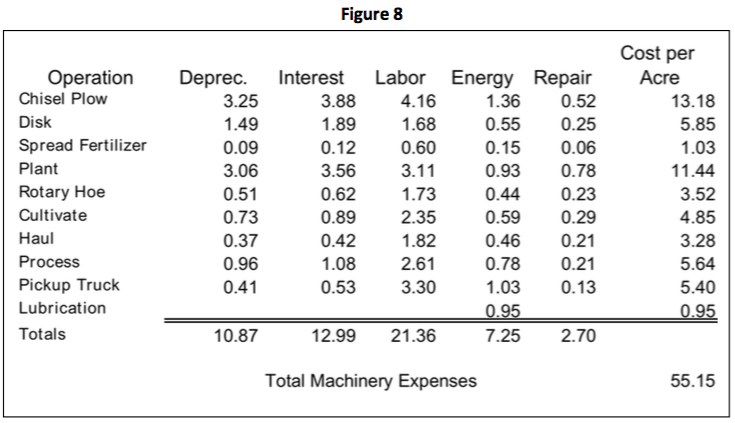 They can be as detailed as the author wishes and can provide information on machinery costs (see Figure 8), labor costs, repair costs, etc. The cropping enterprise’s output is in many instances an input to the same farm’s livestock enterprise. Detailed production records must be kept to determine the cropping enterprise’s operating profit and utilization records must be kept to determine the livestock enterprise’s operating profit. These two sets of records must be reconciled. The total production of the cropping enterprise should equal the amount utilized by the livestock enterprises plus cash sales and inventory change. In addition to problems in the assigning of yields, there can be problems in assigning prices to the cropping enterprise’s outputs. Relative long run prices should be used when doing a planning enterprise budget. Actual prices should be used when doing a short run planning budget or a financial analysis enterprise budget. The internal production cost of feed should not be used as the price of feed in a farm’s livestock enterprise budgets because it produces a livestock enterprise budget with the livestock output as a residual claimant. Residual claimant means that any profit (or loss) that the cropping enterprise had is now part of (claimed by) the livestock enterprise’s profit (or loss). Example: Suppose the long run average price of corn is $2.40 per bushel and this year you raised corn for $1.50 per bushel. If you feed 50 bushels of your raised corn, per head, to your steers and charge the steer enterprise a $1.50 per bushel for corn, you are stating that your corn enterprise is a zero-profit enterprise. Also, you are transferring $45 (50 * ($2.40 – $1.50)) of profit per head from the corn enterprise to the steer enterprise. The transfer of feeder cattle, feeder pigs, dairy heifers, and other livestock between enterprises requires that those enterprises be separated out and analyzed as a distinct entity. This is possible on some farms. If so, it is desirable to credit the producing enterprise and charge the using enterprise a price as near as the long run market price as possible. Again, the internal production cost should not be used. Livestock sometimes utilizes salvage feeds. These salvage feeds would not be used if the livestock were not raised, therefore, the crop enterprise should not be credited for the salvage feed’s value and a manure credit should not be taken by the livestock enterprise or charged to the cropping enterprise. Fencing and other costs associated with harvesting the salvage feeds should be charged to the livestock enterprise. Crop residues should be credited to the crop that produced the residue and charged against the crop that uses the nutrients. Green manure crops should be charged against the crop using the nutrients. Livestock provide manure for the cropping enterprises. Its value should be credited to the livestock enterprise and charged to the crop enterprise. The machinery costs associated with waste removal should be charged to the livestock enterprise. Enterprise budgets can be used as a planning tool or an analysis tool. They can help the farm manager better understand the pros and cons of a component of their business. Producing sound enterprise budgets requires the author to have both a detailed understanding of an enterprise’s production practices and an understanding of the basic budgeting framework. Sound enterprise budgets provide more information than just the enterprise’s profitability. They can identify the most profitable enterprises on a farm, provide the basis for partial budgeting and cost of production calculations, and be used to produce break-even price and/or production analysis, as well as sensitivity analysis price or production factors.